Manick's artwork in multi-media as a part of the 8th Annual - 2009 Arvada Art Studio Tour, will be held at his studio at 14565 West 58th Place, Arvada, CO 80004, on September 12 and 13, 2009, 10 AM to 6 PM. The show is open to public. The visitors will get a glimpse of his contemporary art painted in digital media; news-art, where portraits of news-makers are pieced together with relevant newspaper clippings; tile collages and tile paintings of Indian icons; portraits of Hindu Gods and Goddesses with spices and grains, etc. For a quick sample of some of his work in multi-media, click on Artist icon above. 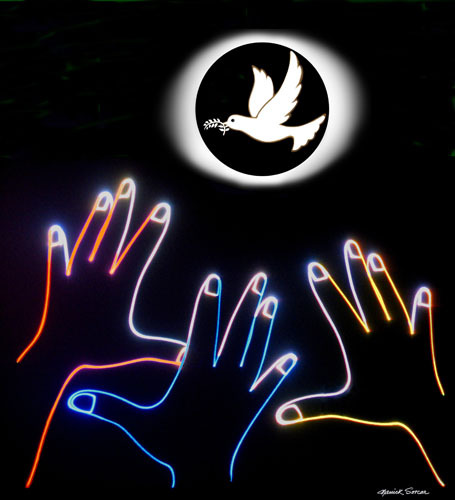 Laser Art: Come and experience a real laser art projected on wall. The entire 3-D art is created by a single beam of laser. Spice Art: Barack Obama crafted with lentils, onion seeds, barley, spices etc. "World of Manick Sorcar Where Art Becomes Magic" : A limited quantity of signed copies of the popular book on Manick's art (a hot seller online at amazon.com and best seller in non-fiction category at the Tattered Cover Book Store), will be available for purchase at the art exhibition.